Windows 8 is sort of like two operating systems in one. It has a dual personality. It’s so-called “Start” screen is a collection of tiles, formerly called the “Metro-style” interface, now just called the “Modern user interface” or “Windows 8 user interface.” I’m not sure they’ve settled on what to call it. I guess Windows 8 interface is the moniker of the moment, so I’ll go with that. 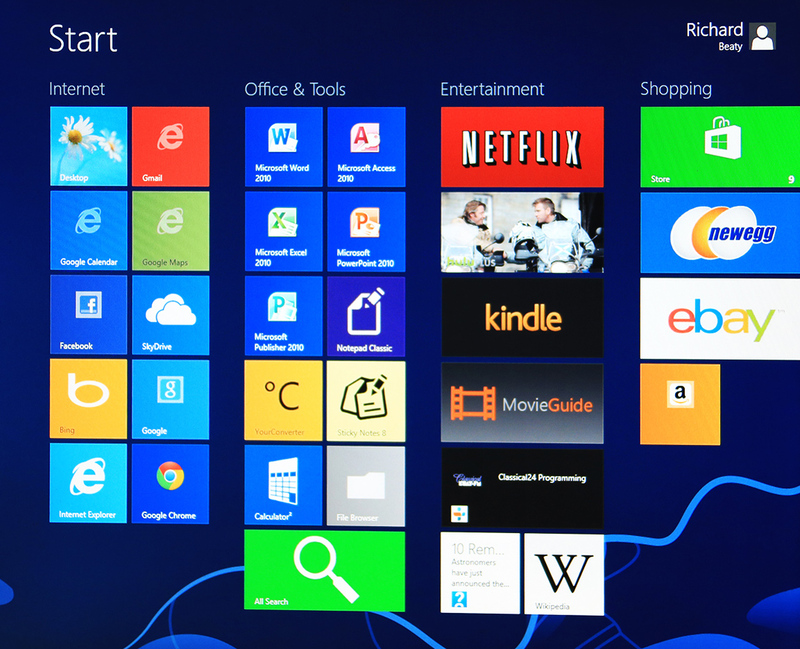 If the Start screen of the Windows 8 interface is personality #1, a more traditional Desktop interface is personality #2. The desktop is where you will go to run all your old Windows programs. It looks pretty much like Windows 7, except it has no start menu. See more on this below. When you fire up Windows 8 in comes up in personality #1 with the new Windows 8 interface Start Screen. This screen is characterized by a grid of tiles, some displaying live information. Clicking on a tile launches the corresponding app. Tiles can be moved around and grouped according to your preferences. This entire interface is what’s NOT to like for many. It is such a break with tradition that long-time Windows users are having a hard time accepting it. For instance, there are no windows in the Windows 8 interface. Yes, the exact feature for which the Windows operating system was named is missing. For those who wish to keep me totally honest, you can dock two programs side by side. But that’s it. You can’t resize windows and move them around on the screen. The other irritation for Windows purists is that you have no choice in how Windows 8 launches. Even though Windows 8 has a Desktop option, it starts out with the Start screen and requires you to click the Desktop tile to move to the more traditional Windows interface. To me, this is a pretty minor issue, but if you’re already irritated with the whole idea of the Start screen, you get reminded of how upset you are every time you launch Windows 8. The traditional-looking Windows desktop is accessed with the Desktop tile. Click the tile, and you’re there. Not only does this look familiar, you can also run all full traditional Windows programs from here. So what is there to be upset about? For whatever reason, Microsoft chose to eliminate the Start menu that is launched with the Start button on the extreme lower left of the screen on all previous Windows versions since Windows 95. This is a feature that had evolved over the years to near perfection. Why Microsoft chose to eliminate it boggles the mind. Not only has Windows 8 lost this tremendously useful feature, but its absence has given long-time Windows users another reason to hate Windows 8. Now for the other side. I’ve been playing with Windows 8 on a test computer for awhile. After the initial shock, I’ve begun to – well, not like it exactly – but at least to appreciate it for what it is. Click a tile to start your program. Winner for expediency … Windows 8! I have reorganized the tiles on my Start screen, placing those programs I use most often in the left-most group, and then grouping similar programs and apps together in additional tile groups, which I can browse as I scroll to the right. If you can’t find an app by browsing the tiles, just start typing its name and you’ll see a list of apps that match your input. Here’s a feature which I think many early evaluators of Windows 8 may have missed. If you move to the lower left of the Start screen and right-click, you will open a menu that has many of the selection options that could be accessed from the old Start menu. It’s still not the equivalent, but it goes a long way to appease me. There’s a strategy in Windows 8 that explains its dual personality. Personality #1, the Windows 8 tile interface, is clearly targeted and optimized for touch devices. Tablets and touch screens are rapidly growing in popularity, and may ultimately topple the notebook computer for portable and travel computing. Hence, Microsoft is right to address this new type of human interaction with computing devices. But my choice for an office computer will still be a keyboard, mouse and a large monitor or two. The Windows 8 Desktop, personality #2, will let me keep working in my office in a pretty much familiar environment. So, Windows 8 seems to be optimized for both … two different kinds of interaction … two different interfaces to address them. I’m one of those people who love tech gadgets. But, I’ve deliberately held off buying a tablet, waiting for Windows 8. They are now starting to appear, and many more are coming. If you think a Windows 8 tablet might be in your future, there is some very important information you should know. Not all Windows 8 tablets are created equal. The so-called Windows RT tablets are similar to current Apple and Android tablets, in that they only run apps designed specifically for the device. Apple has its apps; Android has its apps; and now, Microsoft has its apps. A Windows RT tablet will NOT run legacy Windows software. They will be great devices for content consumption (movies, ebooks, etc), and they will have some very useful apps. But they are NOT full-functioning computers. On the other hand, a Windows 8 or Windows 8 Pro tablet has an x86/64 processor, just like other PCs. Hence these devices are full-functioning computers. They can run any and all Windows software that would run on a Windows 7 PC. These are the devices that interest me. I’ll be waiting till late January, 2013 when Microsoft’s new Surface Pro* tablet is introduced, and then I anticipate joining the growing throng of tablet owners. A Windows RT tablet will be less expensive than a Windows 8 Pro tablet, and hence an attractive option where the available apps meet every need you have. When shopping, just be sure you know your requirements and pay attention to the differences in Windows 8 tablets. For my office – I do not plan to upgrade any of my desktop or laptop computers to Windows 8. That’s not because of any overriding dislike of Windows 8. It’s just that I’m very happy with Windows 7, and I don’t see any compelling reason to switch to Windows 8 for the office environment. For my travels – On the road, that’s another matter. I definitely do plan on purchasing a Windows 8 Pro tablet (Microsoft Surface or other) early next year. The tile interface of the Windows 8 Start screen will take a little getting used to, but I do believe it is a usable, even desirable interface for a tablet. And the Desktop “personality” will allow me to run my favorite Windows software on the same device. It will be a great tool/toy for taking on a trip. If you want all the details about Windows 8, you are in luck. The SaddleBrooke Computer Club offers classes on it for any member of the club. Not a member? This may be a good time to join.